Sightseeing and Dinner Cruises Daily! While looking for things to do in Duluth MN be sure you Choose Your Cruise; from our sensational sunset dinner cruises catered by Bellisio’s Italian Restaurant in Canal Park, exciting narrated sightseeing tours, relaxing cocktail cruises, and pizza cruises with entertainment for the whole family. Experience the wonders of Lake Superior as we cruise next to 1,000-foot lake freighters and oceangoing vessels to take in the activities of the Twin Ports harbor. 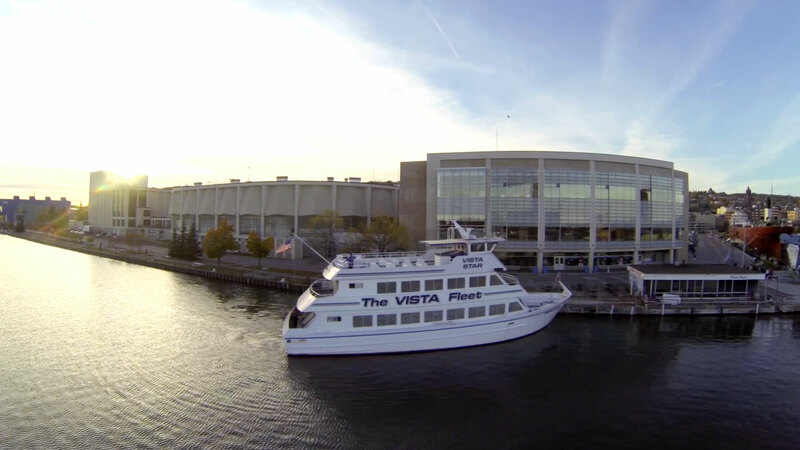 See lighthouses, ships, beautiful waters and more during your narrated tour aboard the Vista Fleet. Choose between three professionally narrated cruises that offer an abundance of interactive fun and information. Experience ever-changing 360-degree views combined with delicious food, narrated tour highlights and music for a perfect night out. Choose from one of our sightseeing adventures or delicious dinner cruises for your memorable group gathering. What better place to celebrate your new life together than aboard one of our real “love boats” on scenic Lake Superior? Every year students of all ages experience the majesty of Lake Superior and learn about Duluth's history. Treat your guests and clients to an incredible on-the-water experience they'll remember for years to come. The Vista Fleet is the perfect solution for any function that needs to make a lasting impression.